Each fisherman is allowed to catch up to ten (10) fish per day, exceeding no more than five (5) fish of any one species. twenty (20) Perch and twenty (20) Carp per day. There is no limit to the practice of catch and release, provided that the fish exceeding the bag limit are returned to their environment in good survival condition. 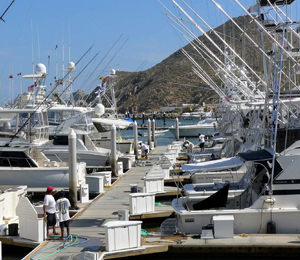 Where Sportfishing is run from a boat that is out at sea for more than three days, the bag limit will be the equal to three times the amount mentioned above. Fish must be taken by angling with a line attached to a rod or with a hand-held line, except when scuba diving. Skin and scuba divers may only fish with hand-held spears or band-powered spear guns. Under water fishing is limited to five fish per day, while skin diving only, using spring type or rubber band harpoons. The use of nets (with the exception of handling nets), poisons, explosives, or traps is strictly prohibited. It is illegal to trade, sell, or exchange any of the fish caught. Fish can be gutted, de-veined, and filleted, however, a patch of skin must be left to permit identification. The capturing of abalone, cabrilla, lobster, oysters, pismo clams, sea turtles, and totuava is strictly prohibited by Mexican law! A form from the Mexican Government Fish Commission must first be obtained from anyone that may want to purchase any of these species to take to the United States. The only place that provides this form is the Oficinas de Pesca located in Mexico. Likewise, designated public markets or fishing cooperatives are the only places where these species may be legally purchased.